MASTER Scheme registration powered by Datatag protects a motorcycle or scooter for life with no additional costs. Fitting MASTER Scheme significantly reduces the risk of motorcycle theft and gives each motorcycle a unique which is impossible to remove. MASTER Scheme is proven to work, MASTER Scheme registered motorcycles are 6 times more likely to be recovered if stolen and 4 times less likely to be stolen in the first place. Recovery of motorcycles through MASTER Scheme is free of charge, unlike some registers that charge huge 'bounty fees'. Customers benefit from reduced insurance premiums and excesses and reduced risk of theft and resulting disruption. MASTER Scheme provides a strong case for provenance and title. MASTER Scheme registrations can qualify for insurance premium discounts. What exactly is MASTER Scheme? 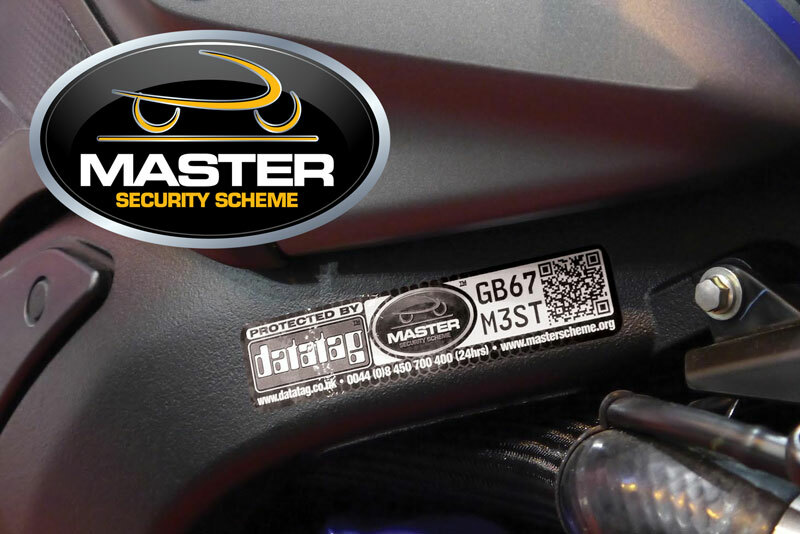 MASTER Scheme is a motorcyle registration and security scheme using Datatag hi tech security markings that acts as a powerful deterrent to theft and an invaluable aid in recovery, in the event of theft. Yes. Reports suggest that a Motorcycle or Scooter without something like the MASTER Scheme & Datatag technology is approximately 4 times more likely to be stolen than a non registered and protected motorcycle or scooter. Plus, the recovery rate for unregistered motorcycles is as low as 5%. MASTER Scheme powered by Datatag has wide industry support, in the motorcycle market, from official bodies including the Home Office and Police CPI, leading manufacturers, the insurance and finance industries. The Motorcycle Industry Association (MCI) actively promotes the adoption of MASTER Scheme. How is my motorcycle protected? MASTER Scheme registered motorcycles are fitted with a sophisticated Datatag multi-layered security system that gives each motorcycle its own unique ‘fingerprint', that is impossible for thieves to remove. Datatag security is made up of 4 elements, both visible to act as a deterrent and covert to aid identification and recovery. Firstly, a number of tamper proof registration plates are securely fitted to the motorcycle's chassis. Secondly, a number of Datatag RFID transponders, each the size of a grain of rice, are hidden in the motorcycle each with its own unique programmed code. Thirdly, there are microscopic Datatag Datadots® which are barely visible to the eye. And finally "Stealth" UV Etching comprises a unique alpha numeric code and Datatag's 24/7 contact details are permanently etched into the panels and fairings. These etchings do not deface or interfere with the appearance or aesthetics of the Motorcycle and are visible under UV lighting. It's virtually impossible for thieves to remove all the tell tail identification traces from a MASTER Scheme registered motorcycle. What type of vehicles can MASTER Scheme be fitted to? MASTER Scheme can be fitted to all types of motorcycles and scooters. Which manufacturers fit MASTER Scheme? Many leading motorcycle manufacturers fit MASTER Scheme powered by Datatag as standard on the motorcycles they supply into the UK and Republic of Ireland. Further information can be found on the latest news section. 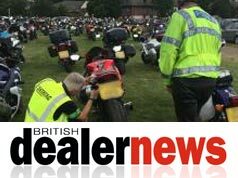 Can MASTER Scheme be fitted to existing motorcycles? No. MASTER Scheme is only fitted to new officially imported UK motorcycles and scooters. However, you can purchase a Datatag Motorcycle or Scooter System to Protect and Register a used vehicle from hundreds of UK Motorcycle & Scooter dealers - please see the dealer locator section. Who can fit MASTER Scheme? Only approved suppliers can fit MASTER Scheme including manufacturers and their approved dealers, which have been approved to fit MASTER Scheme powered by Datatag. How much does MASTER Scheme cost? The MASTER Security System is fitted and protects your new motorcycles and scooters usually by manufactures at no extra cost. If you would like to protect a used machine then Datatag provide an after market system with a RSP of £89.00 plus, you may have to pay the dealer to install the system if you do not decide to fit the system yourself. Do insurance companies give insurance premium discounts? Yes. MASTER Scheme powered by Datatag is supported by many leading Insurers and discounts are available to the registered keeper. If my MASTER Scheme registered motorcycle is stolen what should I do? You should immediately notify the local police and obtain a ‘crime reference number'. However, you should also contact MASTER Scheme. Once you have submitted the details MASTER Scheme will immediately flag the motorcycle as being stolen. Alternatively and for ease there is also a secure 24/7 call centre (Tel 03450 700 450) and database open to motorcycle owners and the police to provide assistance. How do the police determine the true identity of a MASTER Scheme registered motorcycle? If the unique tamper evident registration plate is intact, the police can get all the relevant details from Datatag, just like for a car or van, from the PNC at any time of the day or night. 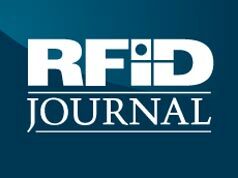 If the registration plate and manufacturers' plates have been removed the police can use a special Datatag scanners to 'read' the Datatag RFID tags hidden in the motorcycle. MASTER Scheme can give the police all the details they need from the unique number from just one tag. As a back-up there are thousands of unique Datatag Datadots® which can also be used to categorically identify a specific motorcycle or part and finally, the Police can easily identify panels and parts with UV torches or "Black Lights" to locate and identify the unique "Stealth" etching within the panels and fairing's etc. 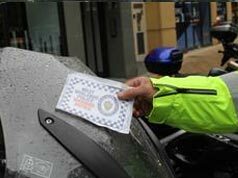 Datatag's MASTER Security Scheme identification system is being used to protect mid-sized motorcycles from theft in the United Kingdom, while city police departments are considering use of the technology for smaller road bikes. Following an increase in the theft of powered two wheelers (PTWs) from Birmingham City Centre during the early part of the summer, a 'lock it or lose it' campaign is proving to be working. Suzuki says it is proud to be the only member of the Motor Cycle Industry Association's Master Security Scheme to be tagging 125cc machinery. Recent analysis of police theft data for new motorcycles, shows a huge difference between machines which are marked with the industry's own MASTER Security Scheme and Datatag technology compared to those which are not. New MASTER protected bikes are six time less likely to be stolen. 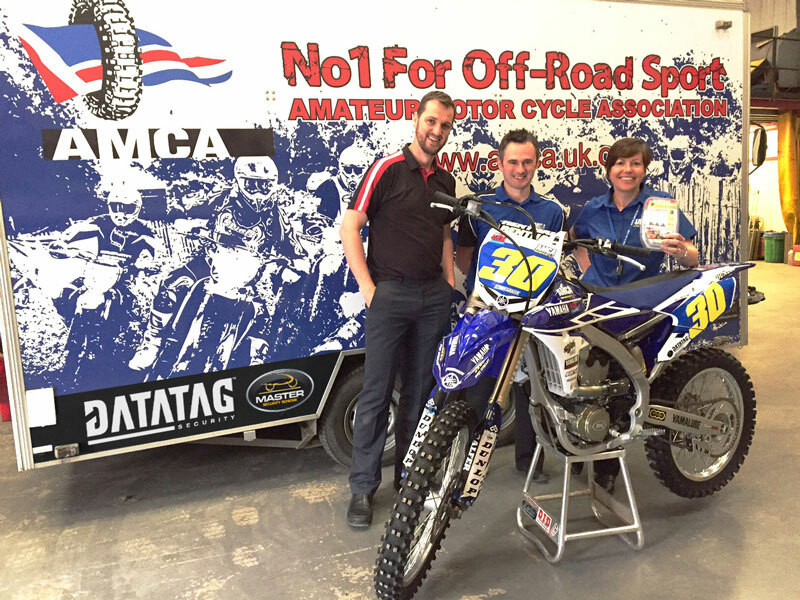 One of the UK's leading motocross race organisations has declared its war on motorcycle theft is continuing by once again partnering with the motorcycle industry's official security initiative, the MASTER Scheme.